On Wednesday, December 7, the Academy Of Contemporary Music (ACM) was pleased to welcome long-standing patron of their Guildford campus Chad Smith through the doors of ACM London for the very first time. Using a rare day off from the Red Hot Chili Peppers U.K. tour, Chad came down to ACM London for a masterclass held exclusively for ACM students and two competition winners. 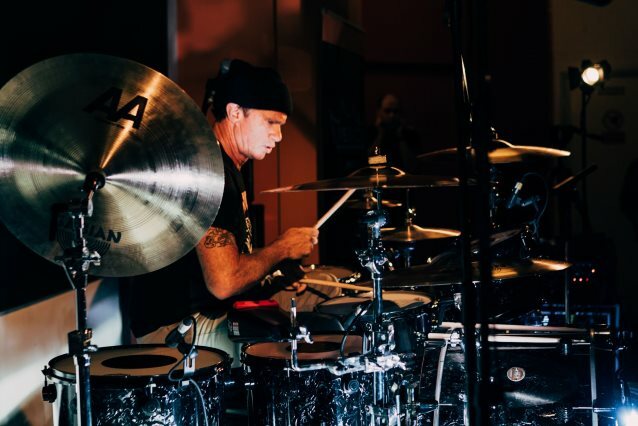 “This is my first time at ACM London, although I have a room named after me at ACM Guildford — the Chad Smith Room,” Chad said. Held in partnership with Rhythm magazine, the masterclass was hosted by ACM‘s head of creative industry development Ace (also the guitarist in Skunk Anansie). The class included an intimate performance in the Academy’s live performance room, before they headed upstairs to the lecture room for a question-and-answer session. Said Rhythm editor Chris Burke: “As one of the U.K.‘s biggest music colleges, with great facilities, top tutors and great courses for drummers, ACM is a perfect partner for Rhythm magazine. Like ACM, we pride ourselves on our comprehensive educational content with video drum lessons from the U.K.‘s finest tutors given away every month on the ‘Rhythm Lessons’ CD.” Read more at Blabbermouth.